This is the second guest post in "A Quiet Hope," the first week of our season-long series called A Quiet Advent. About the author: Christy McDougall describes herself as a 30-year-old female Pentecostal introvert from Montana. She has graduate degrees in theology and plans to teach continuing education to pastors and missionaries in Europe. My memories of Advent from my childhood involve being given Advent calendars with chocolates behind each of the little doors by my Catholic relatives and being terribly excited about opening each day’s little door. That is the extent of my exposure to Advent for nearly thirty years. Though I was raised in a Christian home, we were Pentecostal and didn’t celebrate the Christian Year, except for the normal Christmas and Easter. As an adult, I simply didn’t think of it, because it wasn’t part of my culture. Until two years ago, that is, when I read a short editorial about it in the Religion section of the Sunday paper, and suddenly Advent took on a great deal of significance. The very theological concept of it intrigued and excited me, because theological concepts do intrigue and excite me. My soul is enlivened when my mind is stimulated by some lovely theological idea, and the idea of Advent certainly did that. But it’s also become significant over the last two years because of the current situation I find myself in, a kind of perpetual Advent. Advent is a state of waiting. It’s a short amount of time that symbolizes the whole history of the Jews waiting for their Messiah, the whole longing of creation for a Redeemer. This is the time where we sit back and wait as if we were old Anna and old Simeon, recognizing God’s promises that He is going to change everything for the better and yet not seeing how or when. The Jews waited for thousands of years, and we Christians join them during Advent in waiting for Christ, the Messiah, to be born and turn the world right-side-up again. Advent is a state of liminality, and that is where I find myself these days. Liminality is a term used in anthropology to describe a state of in-between-ness, and I have in a way reframed it to my own context. To me it means the state of waiting between the promise and the fulfillment, the period of time that stretches out for seemingly eternity while you wait for something to happen. It’s Christmas Eve night when you were a child and couldn’t sleep all night for anticipation of the next day. It’s sitting in the hospital waiting to find out whether your loved one is going to make it or not. It’s the time of numbness between a death and the funeral, of waiting backstage for your cue to go on, so nervous you think you’ll throw up, of the hundreds of years between Isaiah prophesying that the virgin would conceive a son and name him God With Us and the time when Jesus was actually born. It’s Christians for the last two thousand years saying, “Even so, come quickly, Lord Jesus” and not yet seeing it. It’s me, stuck between a call to missions and that undefined, tantalizing time in the future when I will be financially in the position to go do it. Tantalizing, aggravating, frustrating…just waiting. Waiting and hoping. It’s a time for hope, this liminality, and for trust. Liminality gives us room to learn a quiet trust in our Father, who is not slow in keeping His promises. Isaiah, the prophet we quote most when it comes to Christmas, says, “You shall triumph by stillness and quiet; your victory shall come about through calm and confidence” (Isaiah 30:15, Jewish Publication Society version). We’ve been given promises by the God whose nature we trust; I’ve been given a call to missions by a God who has never broken faith with me. I think of this little piece of Hebrews, in between two verses: “Yet at present we do not see everything subject to him. But we see Jesus…” (Hebrews 2:8c-9a). We see what God has already done, and that gives us room to grow in faith, hoping for a promised future we cannot yet see. I am in a state of liminality, and Advent reminds me to hope that more is coming. This post is the first guest post in "A Quiet Hope," which is the first week of our season-long series called A Quiet Advent. Melanie Springer Mock is a Professor of English at George Fox University, Newberg, Oregon. Her essays and reviews have appeared in Christian Feminism Today, The Oregonian, The Chronicle of Higher Education, and Mennonite Weekly Review, among other places. Her most recent book is Just Moms: Conveying Justice in an Unjust World, published this year. She blogs about (and deconstructs) images of women embedded in evangelical popular culture at Ain’t I a Woman? The story in Luke 1, narrating the angel’s announcement of Jesus’ birth to Mary, begins the Advent season of waiting. As we wait, we recognize as well our need for God to rescue us from what enslaves us. The angel’s announcement to Mary brings hope and expectation into that need and reaches across the dark December days until the celebration of Christ’s birth. Before I had children, I thought I understood what such hope and expectation and waiting meant. That is, until we adopted Samuel Saurabh—my second son, who made me wait two years to meet him. Two years after we adopted our first son, Benjamin, we saw a picture of Saurabh, staring at us mournfully on an agency waitlist, wearing an orange t-shirt. This, we knew immediately, was our son. Sixteen months old. Barely standing. A troubling medical history. A cerebral palsy diagnosis. But. Still. We said yes to Saurabh in India, and began to wait. Our agency promised six to eight months until traveling—a length of time I felt bearable, but only barely. Eight months slipped into a year because of agency error, orphanage problems, the Indian government. A million times and more, I replayed the three-minute video of a son I hadn’t met, mourning a year together we did not have. Watching that video became an incantation of sorts, a ritual of prayer. Please God, be with that boy there, the one kicking the ball, and hitting his friend, and hamming for the camera. Please make something happen so that we might know our son. Not my will, but yours, I wanted to add. But could not. Finally, news: our adoption had cleared its first Indian hurdle, and the process could grind forward. Then that summer, in 2005, our wait for Saurabh was delayed, again and again: first, by a month-long closure of the Indian courts that made hearing our case impossible; and then, only days before we were to travel, a record-breaking monsoon in Mumbai cancelled our trip. But also killed thousands, leaving even more homeless. Please God, I prayed through disappointment, give me perspective. And then, 20 months after first seeing Saurabh’s picture, over two years after signing with an agency, our longest wait was over. We first held Saurabh on a sultry Mumbai morning, though it was immediately clear our son had not been waiting for us. Saurabh spent his last morning at the orphanage sobbing, wiggling out of my arms, crying for his caretakers to save him from the big white folks who had come to take him away. During our two year wait, people kept telling me the moment I held my son, I would immediately forget the deep sorrow that accompanied our yearning for Samuel, the sense that time was passing—that our son was growing older—without us. Yet our wait was so long, and so painful, so filled with anxiety and mystery and sadness, I knew I would not forget, even as I cradled my boy for the first time. This expanse without Samuel would be part of his own life story, and part our family’s story as well. On Christmas Eve, shortly after Samuel’s arrival home, we took the boys to our church’s candlelight service. The children’s pastor stopped us at the door, wondering if we could help her. A little later, as I watched from the balcony, Ron walked down the center aisle of the crowded church, holding hands with each son. Benjamin skipped and Samuel ran beside him, trying to keep up with Ron’s long stride. At the crèche, Ron and our sons situated wise man statues next to the manger, the whole nativity made askew by my sons’ small hands. And there the holy family stood with shepherds and kings and donkeys—seeming a little crazed, a little off center—waiting for their world to be transformed. After placing the figurines in the nativity, Samuel climbed on my lap and nested against my chest. He sat silently for the remaining service, listening to scripture, humming along to carols. When the homily finally ended, Sam cupped his hand in mine to receive a lighted candle from his father. Sam’s brown eyes glinted bright in the flame, witness to this ritual of fire in church and of light glowing in the darkened sanctuary. As I sang “Silent Night” into the nape of Sam’s neck, I sighed at the miracle of my newest son. For some people, the Advent season on the church calendar is one of the most anticipated times of the year. For some, there is no other time in which their love of God is stronger, there is no other time in which they are more aware of God's mercy in their lives and in the world, there is no other time in which their hearts go out to others with such affection, and there is no other time in which their joy is more profound. For me this time of year has always been a spiritually dry time. There is a line in a Counting Crows song that says "You can see a million miles tonight, but you can't get very far." That is my experience during this season. Every year I anticipate it with everyone else, hoping that this year will be different. Maybe this year the earth-shattering experience of God will take place, and I'll be able to take in the seismic joy that should result from the knowledge that God entered the course of human history to reclaim it as his own. But by December 26th, I'm left with disappointment, another year of not getting very far. I experience a deep division within myself during Advent. My inner world stirs with longings for deep experiences of grace, for moments of pregnant silence, for times of candlelit reflections on the fullness of deity wrapped in a child. But my outer world is harassed by the rampant activity, the hurried crowds, and the consumeristic clutter of the season. I think my personal division reflects a broader cultural division. I'm willing to suspend my cultural cynicism for a moment and speculate that at the root of American consumer Christmas is a deep-seated desire for meaning. I may be way off on this, but I suspect the decorations, the music, the saturated social calendars, the capitalistic flurry, and the caloric overload are attempts at finding something true, something significant. Hopes for discovering community and transcendence. There is a neighborhood near my own that puts on an unbelievable show of lights, music, and decorations for the weeks leading up to Christmas. Cars line up for blocks to meander through the illuminated streets and residents sit in their driveways around firepits and chat with the passersby. Aside from laying a carbon footprint likely visible from outer space, it is a powerful display of community spirit. The problem, I think, is that our culture doesn't know how to truly celebrate. Overconsumption and overstimulation are the only ways we know how to mark a special occasion. Even though most of us implicitly know it doesn't work and that we're going to wake up with a hangover, it's all we know how to do. When there is a significant event, we commemorate it by scurrying around, spending absurd amounts of money, gathering a crowd, and turning up the volume. If we're not weighed down by anxiety and insomnia, then it must not be a very important occasion. Our holiday "celebrations" therefore seem destined to only get bigger and bigger, because we have built up such a tolerance. Then we rush home, hustle the kids into bed so we can finish wrapping gifts and stuffing stockings, because they'll be up in five hours. Sleep in heavenly peace indeed. I was originally asked to write about this topic because I have written a book about Christian introverts, those in the church who prefer a quieter, slower, more contemplative lifestyle and who, for those reasons, often find themselves on the fringes both of the culture and of Christian community. I saw a blog post recently that called January 2nd "Happy Introverts Day" because of the notorious nature of the holiday season for those of us who find social interaction tiring and sometimes stressful. But the truth is that the need for a quieter, less cluttered, more reflective Advent season is not restricted to introverts. The clatter of the holidays has caused people of all temperaments to turn from the inner places of our souls, contributing to the superficiality of our spiritual practice during this season. We need to find a new way to celebrate. In the early centuries of the Church, celebrating Christmas was a counter-cultural activity. It's unclear whether the church fathers chose December 25th to co-opt the already entrenched pagan festival of the Unconquered Sun, or whether the pagan holiday was established to rival the Church's celebration of the birth of Christ. What is clear is that Christmas was a subversive event, providing an alternative to the mainstream culture's celebration. In our world, quiet is counter-cultural. I'm not only referring to quiet on the outside, but also quiet on the inside. In fact, it may be easier to shut out the external voices than it is to silence the internal noise. It's often those inner voices, especially the unacknowledged ones, that compel us to fill our lives with movement and agendas and spending and eating. Our behaviors and hurry are echoes of our inner doubts about our worth. Sadly, in many ways the nature of our holiday celebrations reveal how incompletely we have embraced the actual message of Christmas. In contrast to the dizzying nature of our cultural celebrations, the biblical narratives about Jesus' birth speak in hushed tones about simple, unsophisticated scenes. The baby of prophecy, the King of kings, is born in a quiet town in an inconsequential region to unremarkable people and placed in a trough in a barn. Yet by the grace of God this spot becomes the center of the universe, the matrix of hope and redemption and salvation. The quiet, ordinary place becomes the beginning of the dramatic climax of the great Story. The birth of Jesus incarnates the promise that we are not alone and that we are loved beyond measure, recipients of a love that brings peace and stillness to our souls. The birth of a child is both a time of poignant gratitude and a time of quiet anticipation. I remember how friends of mine described the day they brought their first child home from the hospital. They placed him in his crib, in the room they had been preparing for months, and watched him sleep. For hours they sat in contented silence. My friend said, "It was unlike any other moment in my life. It was the greatest moment of love we'd ever experienced, more intimate than even our wedding night. There was nothing else in the world we needed that day -- we had everything." Yet he also said that as he looked into his son's eyes, he was full of anticipation. Who will my son be? What will he do in his life? Who will he marry? What will be his gifts, his calling? Like Mary the mother of Jesus, my friends stored up these things in their hearts and silently wondered who their child would become. Advent is not only a season of reflection on events past. It is a season of quiet hope, as we await the second advent of our Lord Jesus, who will come and complete his reclamation project. Our celebration during this time of year is necessarily incomplete. In this season we must prepare small, quiet places in our individual souls and in our communities, still longing and waiting for the fulfillment of Jesus' work and the rebirth of creation. I'm still struggling with Advent, still reaching for something that I haven't found yet. I do know that if there is any chance for deep experiences of God's grace and love in this season, we need to open spaces for hope and attentiveness in our hearts. We can't compel God to move, but we can clear away what distracts us from hearing his gentle voice. We can reduce the external clutter of the season by simplifying our celebration. We can slowly savor the biblical prophecies of the coming of the Messiah and the narratives about Jesus' birth. We can devote time to silence and solitude as well as to corporate celebration. We can learn to say "no" when we find ourselves spinning from all the invitations and seasonal stimuli. We can listen to the voices of people who are not often heard over the cultural shouting -- the poor, the hungry, the suffering around the world. We can prepare a quiet place for God to renew his love and rebirth his hope in us. For today, my good friend Mark Roberts poses these questions for us in his excellent ebook introduction to Advent, "Discovering Advent: How to Experience the Power of Waiting on God at Christmastime"
Might it be a good thing for you to set aside a special time in the year to focus more on God so that you might grow in your relationship with him? Might it be good for you to get in touch with just how much you need a Savior? Would it helpful for you to learn to wait on the Lord more consistently and faithfully? Would it be helpful to remember your hope in God and to be refreshed in that hope? Might it be a valuable thing in your life to prepare yourself for a deeper celebration of the coming of Christ at Christmas? Would you like to experience more of God’s peace and presence during the hectic weeks prior to Christmas? Would your faith be enriched if you were to read, study, and meditate on biblical texts that speak of the first and second “advents” of Christ? I don't know about you, but Mark's questions stir up a longing in me to go deep with the Lord during this season. The Savior is coming, and let's meet him, even amidst the clamor of the cultural celebration, in the quiet of our hearts. I commend Mark's book to you (only $3! ), whether you are new to Advent or would like a refresher. If you don't know Mark, he is a remarkable combination of pastor, scholar, and devotional writer. And he's an introvert too. Today we will prepare our hearts for Advent, and then tomorrow we will start preparing for the coming of Christ. About the author: Sarah Markley is a mother, a wife, and a believer in radical grace. She is a writer and speaker and lives in Southern California. She is a monthly staff writer for Dayspring's (in)courage and for A Deeper Story and especially loves to shake things up once in a while at People of the Second Chance. I seem to have good thoughts at 35,000 feet. Even in the midst of absolute exhaustion. I have flown on three different planes today and aside from the flight attendant who told me I looked like someone in a recent movie (but-I-don’t-know-which-one) I haven’t had a single conversation with one single person. 22C seems like an oasis for me. I’ve made my final connection and I’m actually really truly on my way home. I’m working my way home from a conference where for the past 4 days I’ve been surrounded by 250 other women, some of whom are extroverts and some who are introverts pretending to be extroverts (like me) and with that as a context, I plop down in my seat. I’m tired. Like really tired. I’m not tired from my 4am wakeup call (although that and a lack of proper caffeine can have something to do with it). And not even tired from my dashes through both Washington Dulles and Chicago O’Hare because the airline-who-shall-remain-nameless rebooked my flights on a bad weather weekend forty-five minutes apart with no time to use the bathroom, grab the much needed cuppa or even find a suitable meal. It was from the time I spent with people. I love people. I do. One of my favorite things in the world, besides cuddling my daughters or sharing a glass of wine with my husband after the girls have gone to bed, is to sit across the Starbucks table from people like you. I love to laugh, to eat dark chocolate and to engage in smart female conversation with the friends of mine who help to rub off my rough edges and make me a better woman. And to be honest, the women I met this last week are among some of the most amazing i have ever met. However, that defined, people also exhaust me. And now, as I am in the middle of this once in a lifetime collection of people with stories and families and lives and jobs, and we are all traveling southwest headed for home (at least for me), I am so tired that I don’t want to talk to a single one of them. Without reservation, despite recent trepidation and not counting the 7-plus minutes it took a friend and me to shove ice and snow off of the windshield of my rental car using only a DVD case and a credit card, I loved every single minute of last week. But right now I bury my face in my kindle and now monopolize my fingers on the keyboard because I really just need to be alone. I need to focus on the hugs and squeals that will come from my girls and the life that they can give me with their laughter and their drawings and their skinny arms around my neck. I need the life that my husband can offer with his strong arm pulling my suitcase for me as I arrive to my own family in my own car. I need the life that I can only get when I sit in silence. Home makes me ME again only because I feel as if I have given so much I no longer have anything of my own left. Maybe that makes me weak. Or maybe that makes me honest. I’m not sure. So I sit, surrounded by people in seats all facing the same way and I have decided to release myself from making conversation to 22B. I am giving myself the grace to be silent. Which is also the grace not to always speak up and not to always know what to say. It is the grace to be okay with shutting my mouth and receiving that life that both silence and solitude brings. We often forget that not only is it okay to be quiet, but sometimes it is right and good. And for me, it might be the only way to find an oasis in a sea of people. Do people energize you or exhaust you? Do you ever give yourself the grace to be silent? Some meals can change your life. Every Thanksgiving I find myself reflecting on how significant the act of eating is to our lives and even how central it is to our faith. Sometimes it seems odd that we celebrate a holiday that centers on a meal, but then I remember how many unforgettable scenes in the Bible revolve around the table—Moses and the elders eating in the presence of the Lord on Mount Sinai, Peter shocking the Jewish world by eating with the Gentile Cornelius and, of course, Jesus presiding at the Last Supper as the head of His new family, a sacramental meal replicated countless times throughout the ages. The meal that changed my life featured an oversized helping of pre-packaged lasagna. Truth be told, I don’t like lasagna. But 15 years ago, lasagna became for me the very embodiment of hospitality, to the point that I can’t see a piece of lasagna without being taken back to that meal. It was three weeks before the start of my junior year in college, and I was spending the summer in Los Angeles. I had joined a team of students who were living at an African-American church in a predominantly Hispanic neighborhood. My teammates were Korean and Indian, and I was the only white person for miles in every direction. It was my first real experience of cultural displacement, light years away from anything that felt like home, and I had often felt like I was drowning in multicultural confusion. It is incredible that I associate that time with hospitality, not only for personal reasons, but also because the history of the interaction between the church and the neighborhood was marked by an unfortunate lack of hospitality. Fifty years earlier the neighborhood and the church had been predominantly white, but an influx of African-Americans led to what’s called "white flight," with the bulk of the residents moving north. The church became a black church, with only a handful of white families commuting on Sunday mornings. Two decades later, there was an Hispanic migration into the same neighborhood, and the resultant "black flight" affected everything but the church. The church remained almost exclusively black. There was little to no relationship between the church and its neighbors. Crime and suspicion were high, which I learned firsthand the time I set off the alarm in the church sanctuary and found myself at center stage in a police helicopter searchlight. Our team was asked to help facilitate relationships between church members and the surrounding residents. As you might imagine, four college students from a local liberal arts college were not terribly effective at bridging the divide. After a largely unsuccessful summer, full of team conflict and lukewarm relationships with church members, I lived by myself at the church for two weeks. I was sleeping on a shabby couch that was eight inches too short, sweating through 85 degree nights with no air conditioning. I couldn’t open the windows because of the crime risk, and when I turned on the lights cockroaches would scatter, leading to many sleepless hours imagining I felt them crawling on me. I was just learning how to cook, and most of my meals involved some combination of pasta, red sauce, beans, crumbling tortillas and overripe tomatoes. Needless to say, when Stephen invited me to dinner at his house, I greedily accepted. Stephen was a pastor working part-time at the church while attending seminary. He was from Kenya, and he had moved to the United States for his theological education, bringing his wife and two children with him. He was joyful and affable, with a deep, contagious laugh, just like every other Kenyan person I have ever met. I anticipated that dinner for several days. Stephen picked me up from the church, and my hopes for a home-cooked meal in a comfortable, climate-controlled setting were high. But my spirits fell when we stopped at a budget grocery store on the way to his house, and he bought a large pre-packaged lasagna and salad-in-a-bag. To be honest, I felt angry. This is what he is going to serve? He knows I’ve been eating horribly all summer and that I’ve lost about 15 pounds. He knows I’m living alone in a sparse, uncomfortable setting, and he can’t even cook something from scratch? I don’t even like lasagna! We arrived at his simple apartment—with no air conditioning—and I sat down at his rickety kitchen table while Stephen cooked the lasagna. When it finished baking, he cut me the largest piece I’ve ever seen. Plate-sized is an understatement, since its juicy corners were dripping over the edges. But he only cut a bite-sized piece for himself, as small as mine was big. He explained he had eaten a big lunch. I didn’t think anything more of it as I dove into my piece, my distaste for lasagna temporarily overwhelmed by my ravenous, 20-year-old hunger. During the meal, while picking at his food, Stephen asked me about my family, my major, my friends and my future plans. I remember how genuinely interested he was in my life and how he encouraged me to consider seminary. Halfway through dinner, his wife crashed through the front door, in tears, and immediately retreated to the bedroom. After returning from comforting her, Stephen explained that she had started a telemarketing job that morning but had been fired after just a few hours because no one could understand her thick accent. This was the third job she had lost in a month. Later, after she recovered, she came out into the living room and we shared a wonderful conversation, with much laughter. Some of their missionary friends stopped by, and they all told stories, from their narrow escapes from thieves in the middle of the night to Stephen’s tale of praying for a wife and then meeting her two days later. I lingered as long as I could that night, relishing those hours of feeling at home. Looking back on that night, I am astonished at how long it took me to put all the pieces together about that meal and about their situation. It wasn’t until I was in seminary, three years later, that I realized the full truth. That store-bought lasagna, the one I complained about, was their family’s food ration for the entire week. Two adults and two children, living on a part-time income and meager savings, were going to eat what was left for the next six days. Stephen had served me an overflowing portion of something he couldn’t afford to give. A life-changing meal is not defined by what you eat, but by whom you eat it with. Tax collectors and prostitutes ate meals with Jesus the Messiah and received acceptance, Gentiles ate meals with the apostles and gained salvation, and I, a self-absorbed, naïve, entitled college kid ate a meal with a Kenyan pastor and his wife and received a gift of extravagant, sacrificial hospitality. Stephen and his family still live in the area. I think it’s time I buy some lasagna. This article originally appeared on RELEVANT magazine online. About the author: Ryan Haack is a husband, father, writer and the Associate Pastor at The Journey Community in Madison, WI. He has created more blogs than one person ever should, which you can read at RyanHaack.com. You can also follow him on Twitter @RyanHaack. Here’s the deal, though: For as nervous and uncomfortable as it makes me, I do it every week because it’s worth it. It’s absolutely worth it. It’s frustrating because I love people. I love Jesus and I want to share him with people who don’t know him. It bothers me to no end that my introversion gets in the way of that so often. Sunday mornings, then, have to become a time where I “become extroverted” for a little while. Taking five minutes to sit at a table of strangers and ask them about themselves is not going to kill me. Shaking the hand of a visitor and telling them I’m glad they’re here isn’t going to, either. It’s not always easy, but I can do it. My friend George, on the other hand, is the epitome of all things that are good about extroversion. If you come to our church, you will not escape the kind and joyful arms of George. Literally. He will hug you. He will also ask you about yourself and will be genuinely interested in your response. He will also ask you how you are doing and really want to know. A couple years ago this caused friction between George and me. He was not willing to accept my “I’m fine” response; he wanted a real answer from me. “George! Seriously! I’m FINE. Just accept that! Sometimes people are just ‘fine,’” I said. Ok, I didn’t really just say it. At the time, I don’t think I understood how my introversion affected me, so instead of having a good conversation with George, I lashed out defensively. Thankfully, we worked through that and now serve on our elder team together. I’m not good at a lot of the things George, as an extrovert, excels at. I’m so thankful for him. He’s an excellent example for me. I know I make it sound like I’m miserable on Sunday mornings. That’s not the case. There really is no place I’d rather be. I love the people in my community, and the leaders I get to work with are inspiring. Please hear that. And even though my introversion can make Sunday mornings exhausting, it can also make them incredibly powerful. As I walk around, I’m looking, and listening. I’m noticing who’s there and who’s missing. I’m watching people interact and hearing tidbits of conversations. I see smiles and frowns. It’s incredibly fulfilling to notice when someone seems “off” and to ask them how they’re doing and really look into their eyes, awaiting their response. And I love hugs. A hug says a lot of things an introvert might fumble through if they tried to actually say it. One of my favorite things to do, though, on a Sunday morning is to just sit and be thankful. To look around at all the amazing people I get to call my friends and thank God for them. To be amazed by the kindness and love the people in my community show each other. And to be humbled by it all. Ultimately, Sunday mornings are not about me anyway. They are about Jesus. All I can do is be there and do my best to serve Him and love others. And I’ll continue to do so, no matter what. 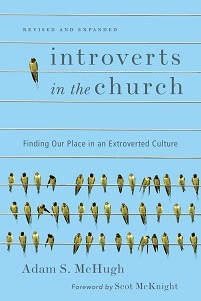 If you want to read more about introversion, leadership, and those people who get tired on Sunday mornings, check out Adam's book Introverts in the Church. A few weeks ago I sent out a call to guest bloggers to write for my series "A Quiet Advent," starting on the first Sunday of Advent (November 27th). The response has been great, but I could use a few more guest posts. I am especially looking for posts on A Quiet Love and A Quiet Peace, and I would also accept a post on A Quiet Joy. No more Quiet Hope though! We don't want to be overly hopeful during Advent. After all, January is coming. If you're interested email me at adamsmchugh at gmail dot com. This is going to be an awesome series. Can't wait! A few weeks ago I dreamed about pioneering a new genre of Christian literature, which I'm calling "nightstand theology." 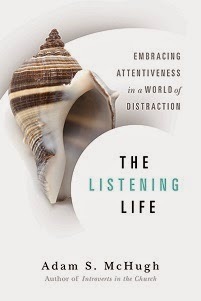 I'm in the midst of writing my second book, which I'm trying to convince InterVarsity Press to call The Listening Life. Mark your calendars for fall 2013, when the book will drop like a bomb on the Christian world. Or, more likely, like an anvil on Wily Coyote's head after he missed the Road Runner, again. One of my points in that previous post was that many Christian books are well, boring. I even get bored with my own writing. To elaborate on that point, I think one of the reasons reading Christian books can be heavy slogging is because many authors feel the need to reassure people that they fall within the historic orthodox faith. They do that by saying the same things over and over. It feels like you can't write even a single chapter without mentioning the cross and sin and salvation through Jesus and the authority of the Bible and the sovereignty of God and the Trinity and the bodily resurrection and the eschaton. It always feel like you have to get all Nicene Creed on everyone. And so Christian books gets repetitive and wooden and formulaic. I heard N.T. Wright lament that every time he gives a lecture, several people come to him and ask him questions about what he didn't address. If he didn't talk about the resurrection, people will say "Are you saying you don't believe in the resurrection?" And so on with the Trinity and the virgin birth and the judgement, and so on and so on. Dallas Willard once said, at the beginning of a talk, "As usual, if I spent all my time saying what I'm not saying, I wouldn't actually say anything at all." I am feeling this pressure as I am writing my current chapter, on listening to God. I'm trying to write no more than 20 pages on this subject, but I fear that if I don't qualify everything and wrap up everything up neatly into a little orthodox package, then I will be nailed for it. I think too many Christian authors are writing out of fear of being labeled a heretic, which not only makes for a bad writing process but also makes for a lot of unnecessary books. If you are just repeating what you have read 5,000 times, then why are you writing a new book? Many authors who aren't Christians don't feel this pressure and I think feel more freedom to push thresholds and to share genuine insight, even if it doesn't match up with what has come before. That is why it is so refreshing for me to read non-Christian literature and why it can be so boring for me to read Christian books. I am convinced that if I want to write a genuinely interesting, truly different sort of book that I need to let go of this pressure to constantly remind people that I'm not a heretic. It's strange to the think that two years ago, when my book was published, people were using the term "emerging church" pretty regularly. My friend Jim Belcher's book, Deep Church, had just been released, seemingly initiating a new conversation between the emerging faction and the neo-Reformed community. That conversation didn't last as long as I had hoped. The term emerging, at one time, connoted a broad swath of the church, but nowadays, the word has largely disappeared, and the community that still employs it seems to fit into one particular wing of the church. It seems that the emerging church has fully emerged, or more accurately, diverged. The river has branched into a number of streams that flow in different directions. Some have taken the conversation further and continue to push the thresholds of the modernist understanding of truth. Some grew disenchanted and returned to classical evangelicalism or went deeper into the Reformed tradition. Others have focused on the missional aspect of the church's calling. I haven't heard anyone else articulate this (though I would guess that others have), but I think there is another community birthed by the emerging church, one that I fall into: the contemplatives. The main reason I am so grateful for the emerging church is because it re-introduced the ancient spiritual disciplines into the evangelical church. The candles and the darkness and the tapestries and the trappings of spirituality may have become a little cliched, but the emerging church introduced a generation of evangelicals to contemplation. We learned something that monastics and Catholics and Orthodox believers have known for centuries: preaching and talking and words are not the only ways to connect to God. We learned that we can meet God in silence and wordless communication, that the "sound of sheer silence" that woke up Elijah to God's presence in his midst, is not empty but intimately full. A common accusation leveled against contemplatives is that we are passive and alienated from the real world. Ronald Rolheiser in The Shattered Lantern said that contemplation, however, is about "waking up" to what is truly happening, to all the spiritual realities that fill our lives. It's about respecting each moment for all that it has to offer, not only focusing on the visible but on the invisible, listening for the unspoken realities of God. Would you consider yourself a "contemplative"? What is attractive to you about the contemplative life? Where do you get tripped up?